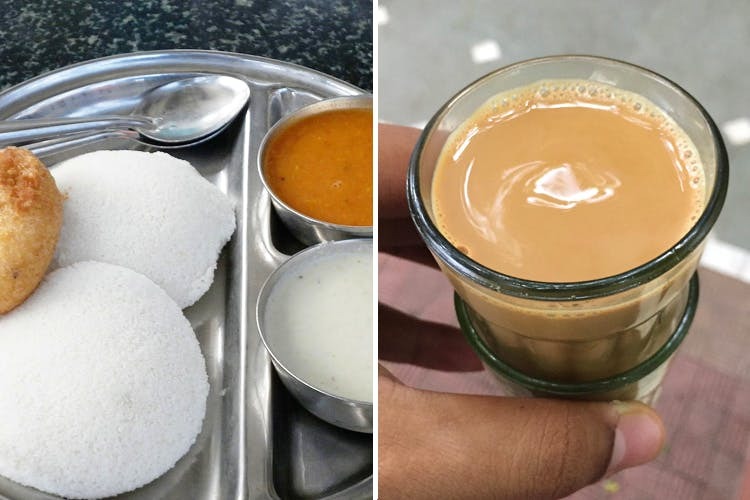 Have You Had The Amazing Filter Kaapi & Breakfast At Mani's In Matunga? We stopped by the humble but legendary eatery, Mani’s for a quick refill of filter kaapi and dosa. Here’s why you should too. The eatery is always buzzing with people vying for a seat so we decided to wait it out till there’s some space. And let us tell you, it was totally worth it. With the breakfast menu starting at INR 20 and ending at INR 125, our barely full pockets bore the brunt happily. The space may be small but it’s popularity is certainly not. You can easily spot college kids enjoying a chai-sutta break outside and office-goers frantically eating to make it back in time. They serve sheera for INR 35, ghee masala for INR 55, idli for INR 35, dahi vada for INR 50 and more. Do have their coffee which has the right amount of coffee kick for INR 25. If you’re looking to expand your list of breakfast places, add Mani’s to your list.